The age-old adage “Prevention is better than cure” holds true for wall care. Go for wall paints that are more resistant to damage and are easier to clean. It might sound gimmicky, but there’s some science behind these paints – they are generally glossier and smoother so that the dirt gets fewer places to collect. We recommend Berger Paints’ Easy Clean Fresh with cross-linking polymers that ensure that even stubborn stains can be cleaned easily from the wall. In addition to its great washability, it also reduces unpleasant smell/odour from within the house and also imparts a fresh fragrance to the interior environment. P.S. - If you’re looking to repaint your walls, you can explore wall paint combinations to build a colour palette for your walls. 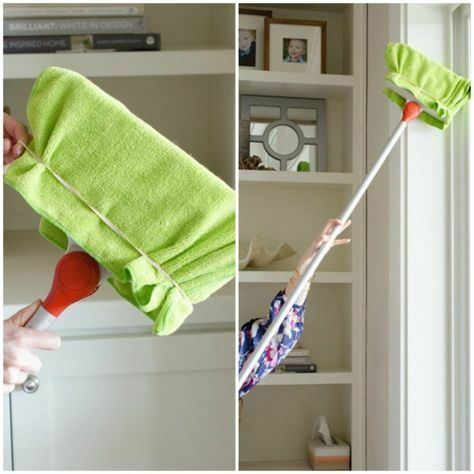 In most rooms, the easiest way to get rid of the dust, dirt, and cobwebs that shorten the life of your paint is to run a microfiber dust cloth on a long-handled broom over your walls every couple of months. You don’t need to take down pictures or move furniture. Areas that are covered don’t get very dirty—and they don’t show anyway. Don’t forget the ceiling though; despite gravity, some airborne dust collects there. It shouldn’t take you more than 10 or 15 minutes to do an entire room. Vacuuming with a soft brush works, too, and so does Grandma’s solution: a clean, white cloth wrapped around the head of a broom. One of the most troublesome (not to mention, expensive) problems to deal with when it comes to wall care is damage caused by water leakage or seepage. More often than not, this kind of damage goes unnoticed or undetected till it actually becomes quite severe. We recommend that you periodically check your walls for sings of flaking or peeling as it could be the first sign of water-related damage. If you do notice a problem, do not procrastinate. Get a contractor to inspect the damage, and you just might be able to identify the source of the seepage early and save your walls from further damage. It may require repainting one or two walls, but it’ll be a whole lot better that having to undertake an extensive repair later on. As a rule of thumb, whenever you get your walls painted, buy extra paint to cover any surface with the exact colours in case of future damage. To keep the paint looking fresh, don’t procrastinate; instead, touch up the damage as it occurs. Sand and touch up a scraped or chipped surface, feathering the paint over the surrounding area. Fill holes first, and coat stubborn stains with a stain sealer before touching them up. You can also use a variety of home-made solutions for common stains. For example, if you have small children in your home, you can use mild detergent and water (immediately, before the stain dries) to clean food stains, and baking soda and water to clean pen/crayon stains. The handy infographic below offers quick, simple cleaning hacks to remove 10 different stains from the walls. The first thing to consider when washing a painted wall is the finish of the paint. Whether a wall paint is glossy or flat finish has an impact on how scrubbing will affect the paint. Flat or Satin Finishes: In general, duller paint finishes are less durable, and need more care when it comes to cleaning. Do not use harsh chemicals when cleaning these kinds of paints and do not scrub too hard with a sponge while washing them. Also, be sure to wrung out the sponge almost completely before scrubbing the walls. Glossy or Semi-gloss Finishes: These types of paints are most commonly used in high-traffic areas like the kitchen and bathroom. Use a mild degreaser on glossy kitchen backsplashes or vanity doors. Although glossy and semi-gloss paint is durable, it will still scratch, so always use a soft sponge when cleaning walls. If you are still unsure of the finish, before washing the walls, test a small patch to see whether the paint is a washable paint or not. Always test them in an inconspicuous spot. If paint chalks off on your sponge, don’t wash that paint. Never wash with trisodium phosphate (TSP) except when you are about to repaint; it dulls the finish. You can wash the walls by creating your own home-made wall wash mixture. Homemade soap mixtures do a great job cleaning painted walls. Both of these mixtures are inexpensive, simple to make, and at least as good as commercially available cleaners. Mixture 1 - Mix 1 cup of borax and 2 tablespoons of dishwashing liquid in 1 gallon (3.8 litre) of warm water. Generally, paint shops keep borax. Mixture 2 - Mix 1 cup of ammonia and 1 teaspoon of dishwashing liquid in 1 gallon (3.8 litre) of water. Start from the bottom. Rub gently with a natural sponge and a soap and water solution Wash and rinse a small area, then move up and do an area that partially overlaps what you’ve already cleaned. Dry the wall with an old towel. Don’t forget to wash woodwork as well.